Nursery Rhymes are such a key part of childhood and some of our favourites are ones that I learnt as a child as well as some that we have learnt at library sessions with both the children as babies. 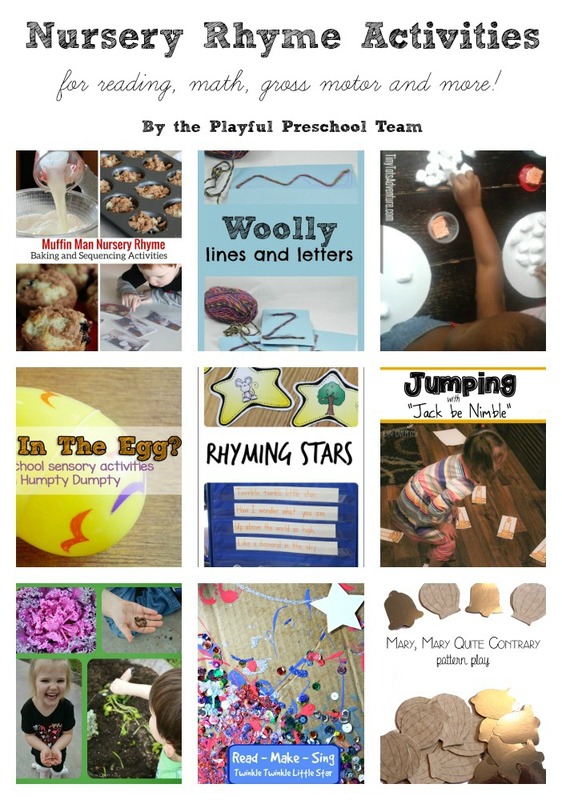 This week’s #playfulpreschool theme is all about Nursery Rhymes, and we’re sharing activities and crafts that will help you to incorporate these fantastic childhood favourites into your home or classroom with your preschoolers. 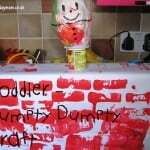 I’ve written about Nursery Rhymes before sharing our 10 favourite Rhymes for Tots, Rhymes to get tots moving and Rhymes for counting. As a child, I had a beautifully illustrated nursery rhyme book that was brought as a birth present. My parents read it throughout my childhood and it still sits in my parents’ house very worn and much loved. Of the rhymes in the book my favourite was Mary Mary Quite Contrary, and I remember the page showing her tending to her beautiful garden with cockle shells at the front, followed by silver bells and then a row of pretty maids behind. With silver bells, and cockle shells and pretty maids all in a row. Taking the idea of rows and the objects from the nursery rhyme, these week we’re working on patterns – another key area of preschool maths. Last week with the snowmen pegs we were looking at 1 to 1 correspondence and counting but to move forward children need to follow patterns – at the moment picture patterns, but later these develop into sequences like times tables, spotting the pattern with the difference between numbers and replicating it. Onto the back of the mirror card draw a simple bell shape and then cut this out. Use this as a template to draw around and produce 10 silver bells. On the oatmeal coloured card draw a cockle shell shape and cut out. I added lines like a cockle shell to the cut out shell. Use this as a template and again cut out 10 cockle shells. On a table start out with a simple pattern, silver bell, cockle shell in a row set out 3 or 4 of the sequence. With your child, look at the objects, and get them to say them whilst pointing to them. Continue on the sequence – ask “What comes next? Make sure you have the two piles of spare cockle shells and silver bells available and ask them to move what is next into place. When they are confident with an alternate sequence pattern, move on to more complex patterns, 2 silver bells 1 cockle shell, 3 bells 2 cockle shells etc. Set out the simple sequence again, and this time complete it leaving 2 of the bells and 2 cockle shells off. Then remove 2 items from the pattern and ask your child to fill in the gap. Repeat this with the longer sequence. To extend this you could add in other objects e.g. some flowers, watering cans or even buttons and make 3 or more item patterns, always start off with the simple sequence and then add in combinations of the sequence. For much older children you could have the pattern repeat after 4 arrangements instead of 2 e.g. 1 cockle shell, 1 silver bell, 2 cockle shells, 1 silver bell and repeat or work on continuing a sequence e.g. 1 cockle shell, 1 silver bell, 2 cockle shells, 2 silver bells, 3 cockle shells…. Check out these other fabulous nursery rhyme themed activities for kids from our archives. Excellent patterning activity! It goes perfectly with the nursery rhyme. I also like that you included extension activities. I love this patterning activity! It is great for building math skills and helps to bring the nursery rhyme to life. Super cute math activities. This is one of my favorite nursery rhymes! We are working on patterning now. Thanks so much for the idea! Love pattern making. What a fun way to play with pattern. Lovely activity! And so simple! 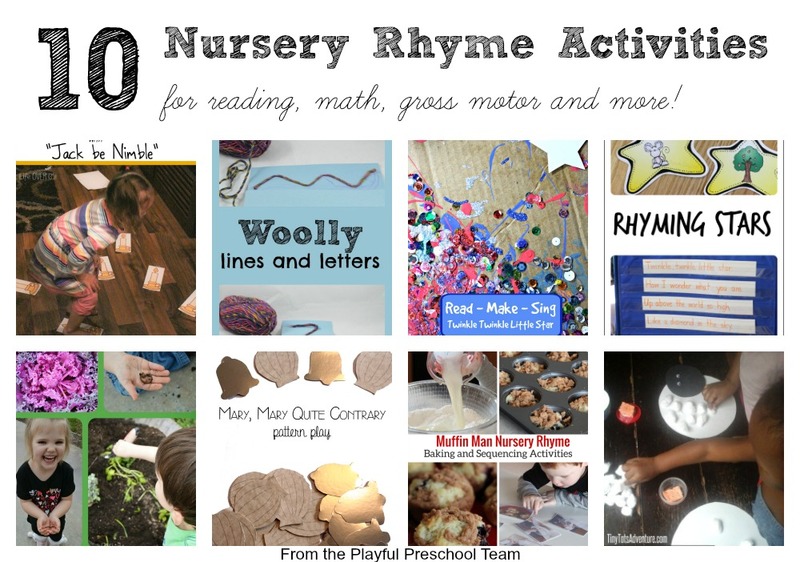 You just reminded me that I have a nursery rhyme board to fill on Pinterest! Have to come back later when I have more time on my hands, to check all the links you listed here!